During the last decades, immunotherapy has been a central area of cancer research and is now an established treatment option in many types of cancer. As compared with conventional treatments, immunotherapy utilizes a different approach to killing cancer cells. Instead of treating with toxic substances, strategies applied in immunotherapy are aimed at boosting the patient’s immune system to fight cancer. Recent successes in this field have provided significant impact on survival for cancer patients, most notably with the introduction of checkpoint inhibition. 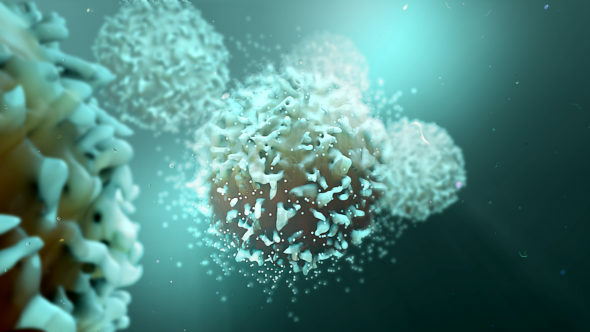 Researchers found that even though some immune cells could recognize and potentially kill malignant cells, they were left inactivated through what’s called immune checkpoint molecules. Immune checkpoints are defense mechanisms exploited by the tumor to avoid the immune system which are otherwise utilized by the body’s tissue to prevent auto-immunity. Checkpoint inhibitor monoclonal antibodies were developed to block this defense mechanism, allowing the otherwise inactivated immune cells to kill cancer cells expressing their cognate antigen. Though many patients experience extraordinary response to checkpoint inhibition, unfortunately the majority of patients do not. Fundamental for a clinical benefit of this therapy is a pre-existing immune response against the tumor. It is believed that a lack of effect can be attributed to a non-existing recognition of cancer cells by the immune system. Ultimovacs aims to increase the pool of immune cells able to recognize and engage the cancer cells, thereby creating an inflammatory response ultimately leading to death of the tumor. To achieve this goal, we have developed a vaccine consisting of a known tumor-associated antigen, found to be almost universal to all cancer types. By combining our vaccine with a checkpoint inhibitor, we aim to mount a strong immune response against the tumor while simultaneously eliminating the tumors ability to diminish this response, opening for a possible synergistic relationship between these two treatment modalities.